The Muhle R41 offers a more efficient or “aggressive” shave than the Muhle R89, so it’s more suited to those with heavy beard growth. Best razor I’ve ever used and with the rose gold handle, the best looking too! I consider myself a reasonably adept wet shaver having used a variety of kit over the years, including various antique open-comb Gillette’s. Having said that I was still nervous to learn about the formidable reputation of the R41. I shouldn’t have had an ounce of worry. Load this up with a good sharp blade (Polsilver super iridium is my blade of choice) and let the beast glide over stubble without any downward pressure and this little beauty is magnificent. I barely needed a second pass, but the beast took all the remaining whiskers without any cuts, nics or burn. I find the R41 has near perfect balance to weight ratio, and had no problems whatsoever with the sometimes reported slippery handle. The rose gold looks stunning and I honestly don’t think think I will find a razor which can provide a closer shave. Treat her with respect and you will be a forever fan. Been wet shaving “properly” (with Merkur 34C) for 8 months now, since removing a 20 year old beard. The Lounge has been very supportive in my journey. It’s been very enjoyable and there are lots of shaving communities out there that I’ve learned a lot from, and i have quite a collection of soaps, creams and brushes already. Shave most days, 3 passes and cleanup with the Merkur. All fine, but some stubborn areas always despite this. So looked around for something more “aggressive” as they say. Took a lot of time researching this and other options and finally went for the R41. Took my time over the last 6 weeks to get used to it, possibly about 14 shaves. Avoided weekdays. Tried it with 1, 2, 3 and 4 days growth. Put a Derby blade in. Each and every time I’ve had the closest of shaves after just 2 passes. WTG and ATG. No cleanup, ATG serves that purpose. The more the growth the more this works better. As others have said, NO PRESSURE, TAKE IT SLOW. GIVE IT YOUR FULL ATTENTION AND RESPECT. You’ll still get a great result quicker than with 3 passes and cleanup. ALSO, those annoying areas (jaw line and either side of my throat) are always BBS. For first 10 goes I always had small weapers and slight cuts, nothing that didn’t get sorted with a styptic pencil. After a particularly bloody session last weekend I realised I’d stopped concentrating. It needs your full attention!! I would recommend getting your technique right with another razor. So this week, I’ve used it on workdays for the first time. Shaving on consecutive days Mon-Wed then again Friday. It’s been a joy. No cuts or weapers at all!!! It is saving me time. Not sure why I’d go back to the Merkur now. Don’t get me wrong, the 34C is a great razor, but I am getting better results with the R41. I would recommend pairing it with the right soap/cream. Need lots of cushion and lasting slickness. I’ve tried it with several, and if the soap/cream is lacking even slightly in either area it will reveal it. I’ve found Body Shop Maca Root does the job as do Fine Soaps. Finally: Most times after one pass WTG it’s been 95% there, perfectly acceptable (and better than the 34C after 3 passes!). With time I hope to try just one pass shaves with the R41. Couldn’t Wait To Use the Muhle R41., Having used the Edwin Jagger DE89 for 6 months which is a fantastic DE Razor, I took the plunge and ordered an Open Comb DE Razor. Two days of growth (heavy) and I put the razor to test. Hearing some of the horror stories about the aggressivness of the Muhle R41, I commenced to shave with some caution. As soon as you glide the edge down your face you can hear the R41 at work. Taking some care I ended up with the closet shave i’ve acheived since i started wet shaving again and not even the slightest nick. And the Rose Gold finish is worth paying the little extra for. Superb Razor. My advise is to use a new blade and dont apply any pressure to the face. That way you will get a fantastic once a week cleanup shave. You can then use that blade for a milder razor all week. Great value for money Razor. 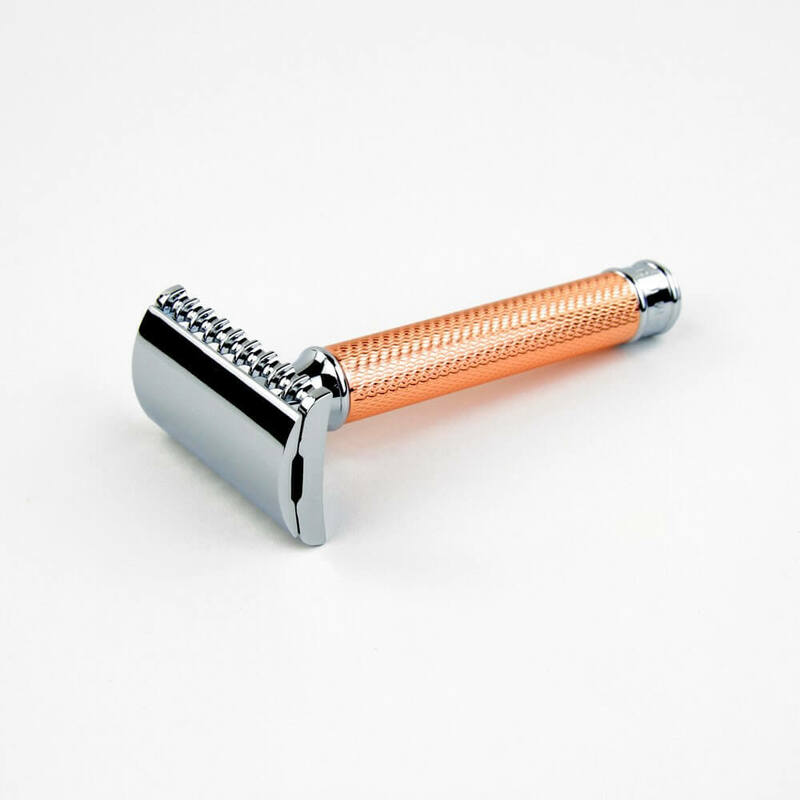 It is an aggressive razor but used as above you will find its perfect for resetting your facial hair for the following weeks shaves or indeed for a special occassion when a close shave is required. Yes, it’s more aggressive than many razors, like the Edwin Jagger. That’s a good thing. Couple it with a sharp blade and a light touch and you have the perfect shave. The rose gold is stunning in person. The finish on this is fantastic. The overall look can’t be beaten in my opinion. The R41 is much more aggressive than the R89 head, with greater blade exposure. Although the handle isn’t one solid piece of steel, it has a good amount of weight to it and is very well balanced. Really good value. Been “humming and arring” over the R41 for a while, what was putting me off were the horror stories – full of blood an gore! Then I saw that they had (slightly) tamed the beast, so I took the plunge. I chose the rose gold version to make it easier to find on the rack… but it does look pretty. All in all a good experience – nothing like the blood bath I was expecting, but I suspect a different blade will make all the difference… the only criticism was that the razor is very light in the hand so a little pressure was needed, other wise she skips over the tough hair. I am giving it 2nd place to my Merkur HD, but this may change with practice!